Blue Cross and Blue Shield of Alabama's mission is to give employers, families and individuals access to quality, affordable healthcare. Blue Cross customers have greater peace of mind knowing this 82-year old company is helping protect their health and financial security. As a corporate leader in Alabama, Blue Cross is committed to positively impacting the health and education of the communities they serve. The sponsorship of "Get Healthy on the Railroad" allows the company to make a positive impact for the community and the overall health of the downtown Birmingham area. With this initiative, Blue Cross is doing the right thing, the right way, for the right reasons. For more information on Blue Cross and Blue Shield of Alabama please visit www.AlabamaBlue.com. All classes are FREE thanks to Blue Cross and Blue Shield of Alabama. Please arrive 15 minutes early to register. You will be required to sign in each time you participate in a class. Feel the burn while dancing to the beat at Hip Hop Cardio! This high&dash;endurance exercise class features fun, hip hop inspired choreography that&apos;s guaranteed to make you sweat. You&apos;ll dance your way to good cardiovascular health, strength & flexibility with our sizzling playlist! Kick into a higher gear with Bootcamp at Railroad Park, a heart&dash;pumping, fun workout that leaves you feeling stress-free and motivated. By using just your body weight, this workout routine will help tone muscles, build endurance, and boost metabolism. Zumba is a Latin inspired dance fitness class that blends basic dance moves with aerobic steps. You will learn why Zumba is called "exercise in disguise" in this fun, energizing, and easy to follow class at Railroad Park. Yoga strengthens and tones the body, promoting balance and flexibility, while quieting the mind. 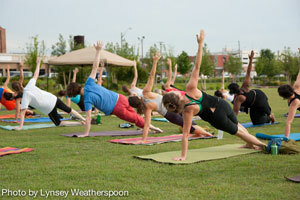 Railroad Park&apos;s yoga class is structured for all participants. Get the entire family on track to better health with this fun hour of low to high impact activity designed to promote exercise for all ages. Families are invited to enjoy team activities like kickball, soccer or wiffle ball. Each class will begin with a warm up and light stretching, followed by the game of the week. In addition to providing physical benefits, Family Fun Friday also provides mental health benefits and social interaction for the entire family. Railroad Park will celebrate the Get Healthy season with a Senior Fit Health Fair, also sponsored by Blue Cross and Blue Shield of Alabama on Monday, April 29, 10 a.m. to noon. Attendees will have the opportunity to see demonstrations of exercises, free blood pressure screenings, free healthy snacks and drawings for prizes. The Senior Fit Health Fair is also free and open to the public. Staying active and social is vital at any age. But for seniors and older adults, the health benefits of consistent and low-impact exercise is critical to maintaining good health. That's why we created Senior Fit &dash; a weekly class that focuses on strength, balance, endurance, and flexibility. It's a great way to stay healthy and meet new people, all while having some fun too. Is there a fee for the classes? Thanks to the generosity of Blue Cross and Blue Shield of Alabama all of the Get Healthy exercise classes are free! Do I need to sign up in advance? No. Participants do not need to sign up in advance to participate in the classes. Simply arrive a few minutes prior to the beginning of the class, sign the class participation waiver, and enjoy! Where inside Railroad Park are classes held? 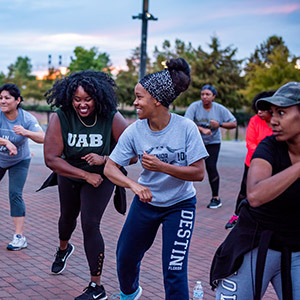 Hip Hop Cardio (Mondays), Zumba (Wednesdays), and Family Fun Friday (Friday) classes typically meet under the Regions Bank 17th Street Plaza Section B. Bootcamp (Tuesdays) and Yoga (Thursdays) classes typically meet on the lawn between 16th Street and 15th Streets. Class locations are subject to change based on availability; please check our website's Calendar of Events and our Facebook site for timely updates. What do I need to bring to the class? Participants should bring whatever they need to enjoy the class. A bottle of water is highly recommended, as are sunscreen, and a sweat towel. Those interested in the yoga class should bring a yoga mat. Are children allowed to participate? Yes. To ensure the safety of our guests we ask that children under the age of 10 participate in the class only if supervised by an adult. It is our hope that each and every person has a safe and enjoyable class experience. How do I know if a class has been cancelled? Classes will be cancelled in the event of inclement weather; cancellations will be posted on the Railroad Park website and Facebook Monday through Friday by 4:00p.m. Class instructors and classes are subject to change based on availability; please check our website's Calendar of Events and our Facebook site for timely updates. May I arrive late? Class begins promptly at 6:00 p.m. Please be respectful of other class participants and arrive a few minutes prior to the class start time. Classes will be cancelled in the event of inclement weather; cancellations will be posted on the Railroad Park website and Facebook Monday through Friday by 4:00p.m. Class instructors and classes are subject to change based on availability; please check our website's Calendar of Events and our Facebook site for timely updates.